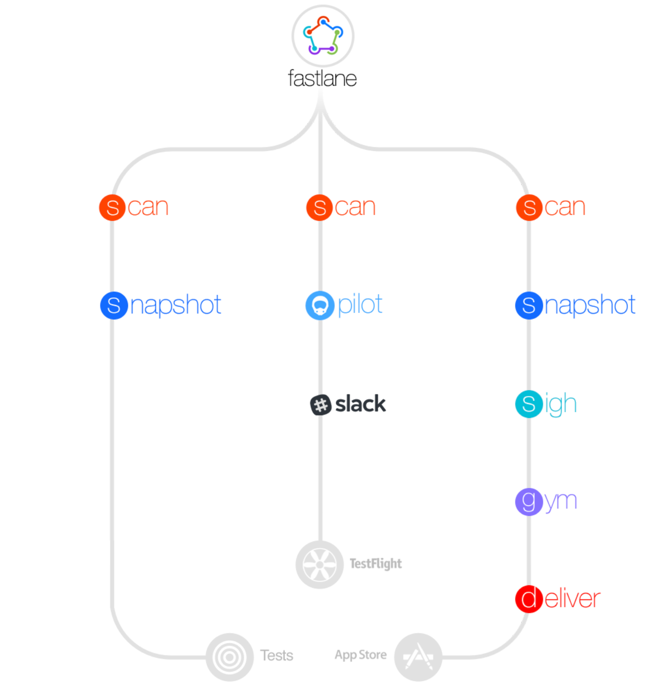 Fastlane is a suite of simple yet powerful tools to automate building and releasing iOS and Android apps. It takes care of the mundane tasks of mobile application development like generating screenshots, managing provisioning profiles, code signing, beta deployments and releasing the application. It is very popular in the mobile developer community and the best part - it is completely open source. produce - create new iOS apps on iTunes and Apple Developer portal. The Android equivalent is supply. snapshot - takes localized screenshots of the iOS app on every device (this is a painstaking task to do manually). The Android equivalent is screengrab. In addition to these built-in tools, fastlane provides an extension model that allows anyone to create plugins like firebase, aws_s3, mobile_center etc. See the full list of plugins at https://docs.fastlane.tools/plugins/available-plugins/. It is very easy to get started with fastlane. Follow the instructions for iOS setup or Android setup. As described towards the end of those documents (see section Use a Gemfile), it is recommended that you use a Gemfile to define the fastlane version and its dependencies in a versioned manner. Once the installation is done, you can create a configuration file named Fastfile in the root folder of your application and define the lanes with a set of actions. In fastlane, lanes are just a collection of actions grouped together so that they can be executed as a single command. It is recommended that all the fastlane configuration files are checked-in to the source repo. Refer this link to set up your .gitignore correctly for fastlane - https://docs.fastlane.tools/best-practices/source-control/. Here is an example of a Fastfile that defines two lanes - one for the beta deployment and another for AppStore release. Integrates well with existing tools and services like TestFlight, HockeyApp, SonarQube, gradle etc. Fastlane supports some cool features that are very helpful in managing mobile applications. Helper class UI that provides interaction with the user - for example UI.message, UI.error, UI.confirm etc. Import fastfile from another fastfile available in a local folder or another git repository.